It is always very difficult to write a “Best of” compilation. My thoughts on a subject may be similar to yours, or wildly different, hence they often cause much debate and controversy. They are also very time specfic, most people will pick a “Top 10” from recent memories. Of course, your favourite genre may also point to your favourite choice. So, tonight I thought it would be a good idea to simply think of my Top 10 videogames, ever! It is probably almost impossible. I could think of at least 10 games that are equally awesome as each other, therefore cannot be numbered as #1. But, again, this Top 10 would also be time specific. Why pick a game from anything pre the current generation of consoles, because they cannot hope to graphically match anything in the “current” top 10. 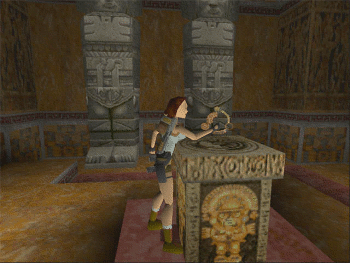 Some games, of course, are timeless and are still played many years after they are gathering dust on the shelf. The revival of such games are prevalent in the current popularity of XBLA/PSN /VC. Anyway, digressing slightly as usual, the point of this ramble is to pick a point in time and chose the best game relating to that choice, therefore you do not have to compare past to present, they are different times! So, choose a point in the past? How? Well, i thought it a good idea to list the “games” machines I have owned and pick the best, in my opinion, game of it’s time. Quite often the best memory is the 1st memory, so that’s how I played it, and here goes! 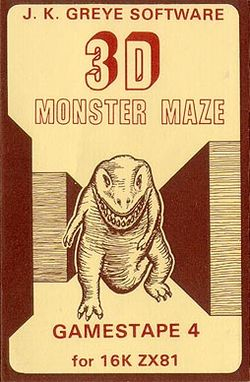 My best gaming memory of the ZX81, you may have already read in a previous ramble, is playing “3D Monster Maze” by JK Greye. This was a mighty achievement in its day, and those of you under the age of 40 (most of you I’m guessing!) have surely missed a treat. No need for me to review the game, you have google for that, but suffice to say it pushed the ZX81 to it’s limits and I would happily still play it today. Despite the chunky black and white graphics and not a squeak of sound, it was a ground breaking achievement. 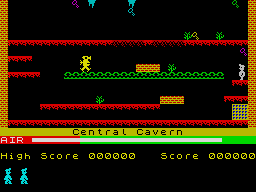 2) Another Sinclair, the ZX Spectrum. Without a doubt, Manic Miner was the cornerstone of gaming in 1982. Sinclair upgraded the world to 8 colours and a single channel of sound. 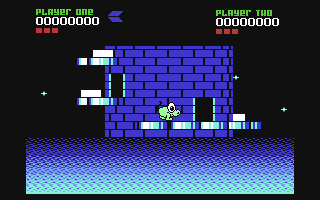 Who can forget the shrillful delight at “Hall of the Mountain King” coming from underneath the speccy. 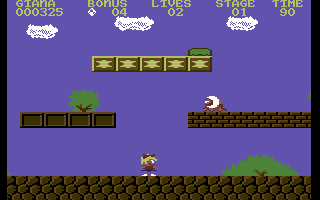 The game was a perfect platformer, long before Mario was a splash on his daddies blanket. Another king of the platform genre: Nebulus was a complete twist of the platform style, with a spinning tower being your object of desire to climb. Guiding the strangest looking creature through one side of a tower, exiting the other and naturally dodging all kinds of freakish obsticles in your path. Reach the top of the tower is all you needed to do, easier said than done! A truly awesome top down run and gun game. 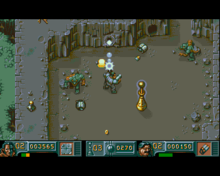 You were, as always, given the responsibility of saving mankind from imminent doom, kiling quite a few bad guys along the way, whilst collecting any loot that may be laying around. Yes, the PC has always been a very good gaming platform, but sadly a good gaming PC would cost you probably twice the combined value of the modern 3 consoles, so it’s not a poor mans hobby. This entry was posted in gaming, retro and tagged amiga, chaos, commodore, engine, giana, lara, manic, maze, miner, monster, nebulus, raider, saturn, sinclair, spectrum, tomb, zx, zx81. Bookmark the permalink.